Supermarkets are strange places. Sometimes they have bizarre ideas about how to make your life easier. And a couple of years ago I reported on how my local Waitrose had an area entirely free from long-life milk. 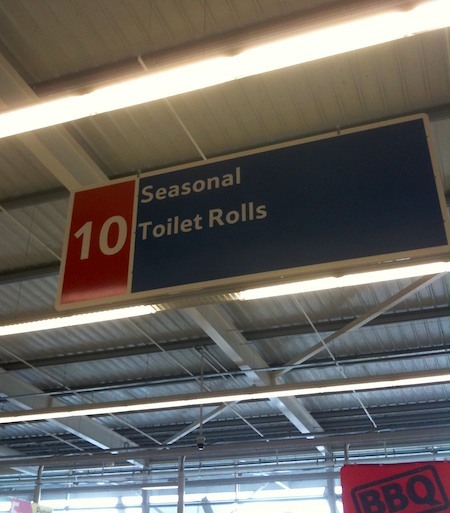 I confess to having used the same kind of toilet roll all year round in the past. Perhaps certain types only grow at certain times of the year, though, and mine were being flown in from Portugal in the winter? I’ve just been watching this great panel discussion with Richard Dawkins, Neil Degrasse Tyson, Ann Druyan and Victor Stenger. It’s about the value of critical thinking and the challenges that religions cause for science teaching. It takes a few minutes to warm up but is well worth watching. It’s an hour long. I hadn’t seen Neil DeGrasse Tyson before – what a great speaker!